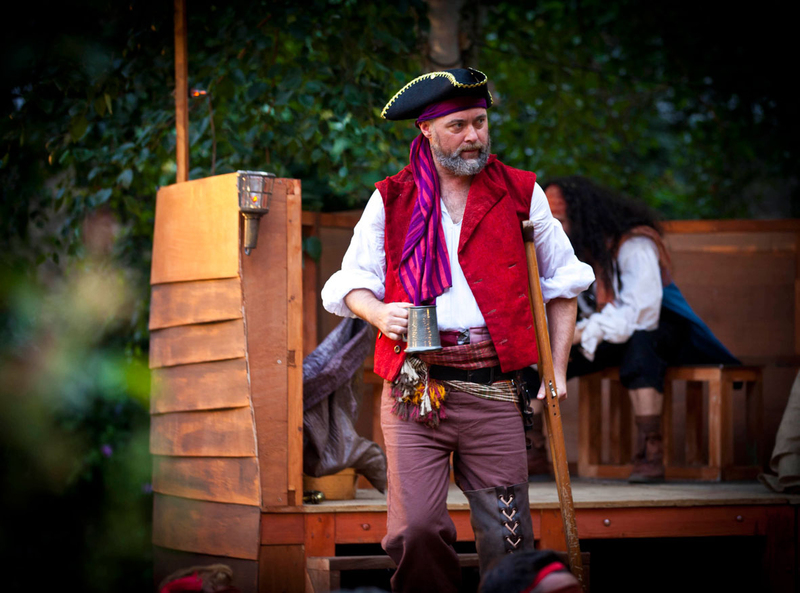 There are some imaginative touches in Iris Theatre’s Treasure Island – the trouble is, in a play that is 2 ½ hours long, they are too few and far between. Daniel Winder has taken Robert Louis Stevenson’s classic tale and boiled it down to an economically staged spin through the narrative. But whilst the budget behind the show may well have been modest (and there’s nowt wrong with that on London’s fringe) Winder allows himself too much of a self-indulgent hurrah with the prose, much of which goes over the kids’ heads and bores the adults. Simply put, there are too many speeches and they are too long. Kids need to see more action, more frequently. The seating of the venue, even amongst the various promenade locations (which include an impressive galleon) doesn’t help. Everyone is sat on one level, so if your little kid aint in the front row, chances are he or she is going to miss a fair amount of what there is to be seen. There were too many looks of boredom on too many young faces at different times throughout the show – and call me old-fashioned, but I like Long John Silver to have a decent wooden prosthetic to hobble around on. Brown plastic wrapped around a clearly visible ordinary boot just doesn’t cut it. That being said – the scenery is imaginative (Valentina Turtur the designer), the acting is all excellent and Seth and Josh my assistant reviewers aged 10 & 7, thought that the swordfights and swordplay (of which there could have been much more) were outstanding – so bravo to Fight Director Roger Bartlett. With thirty minutes (at least) trimmed from the script, this production of Treasure Island could yet make for very good theatre.